Figure 1. There are frequent apparently non-conducted p-waves. 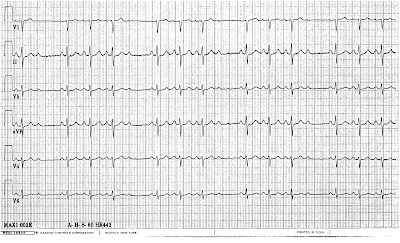 The PR interval is not lengthening, so this is not AV Wenckebach phenomenon. 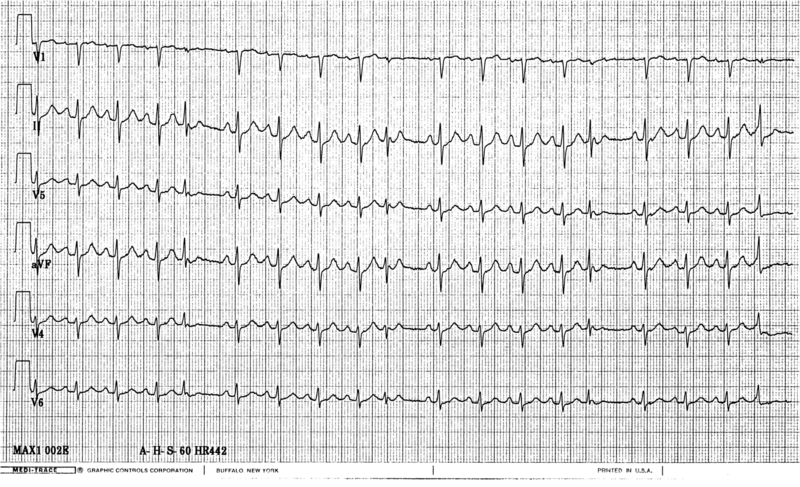 It appears to be 2nd degree AV block, Mobitz Type II. The stress test was stopped for fear that it was induced by ischemia. Figure 2. In this tracing, there are many premature junctional contractions (PJC, premature narrow complex beats without any preceding P-wave). Note that they do not reset the sinus node, which marches out at the same rhythm on succeeding beats. Figure 3. 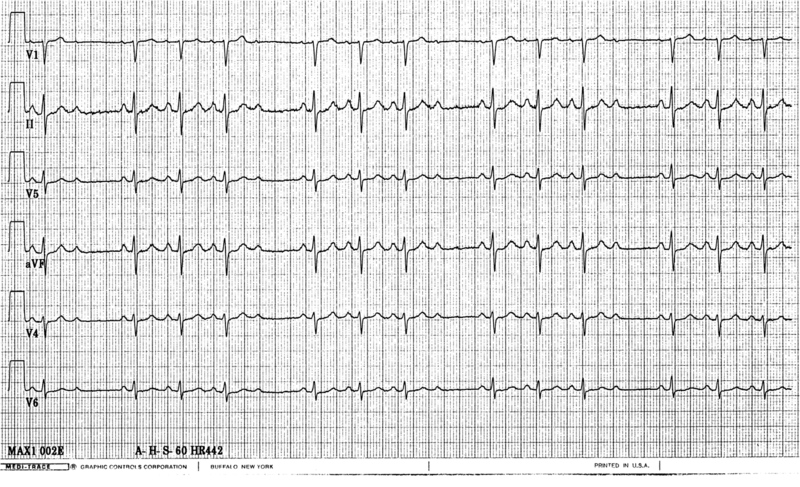 The arrows point out the p-wave embedded in the QRS. 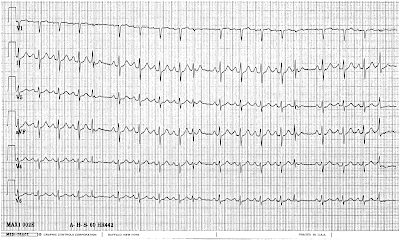 In reality, whether these P-waves are entirely sinus or are a fusion of sinus + retrograde from the PJC cannot be determined because the p-wave morphology is partly obscured by the QRS. Figure 4. Here, the 4th P-wave is definitely different from the other p-waves, indicating that it is an atrial fusion: part of the atrium is depolarized by the sinus impulse, part from another source. What could be the other source in a patient with multiple PJC's except for another PJC? 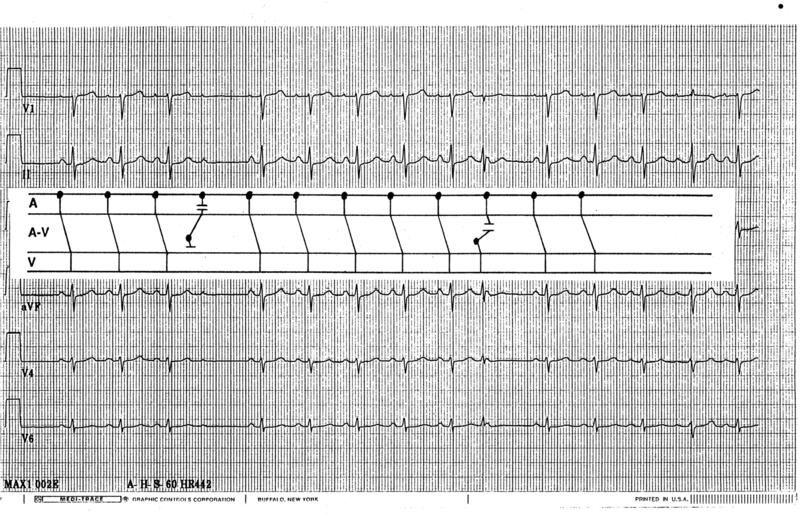 This PJC happened to occur a bit earlier, when the ventricular conduction system is still refractory and is blocked. 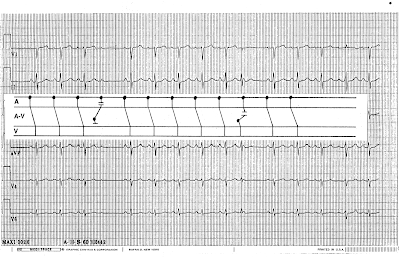 If this nonconducted PJC occurs during AV dissociation, the sinus p-wave will stand alone with no trace of PJC (a concelaed PJC), simulating type II second degree AV block. That is what was happening in figure 1, as diagrammed in figure 5: a pseudo type II AV block. Figure 5. Thus, we have a pseudo type II 2nd degree AV block. It is the atrial fusion in figure 4 that supports or proves this interpretation. [Editorial comment: I (Smith) think that the first diagrammed p-wave (the 6th p-wave) is a bit different from the others and probably atrial fusion; Dr. Wang thinks it may be a fusion but that this is not important anyway]. I believe the interpretation is done retrospectively after seeing the ECG with multiple PJCs right? In this case (and it is in the fine print of the case) the data was all there as part of the stress test. That is to say, figure 2 was also recorded during the same stress test. GREAT case (that I'm just seeing now). I'd answer Ryan's excellent question by the concept I use all the time = "Birds of a Feather flock together". By this I mean - when a given patient manifests a similar phenomenon elsewhere (ie, multiple PJCs on other tracings) - then it becomes that much more likely that the difficult-to-explain phenomenon you are seeing is ALSO a manifestation of the same phenomenon (in this case PJCs - which occur at slightly different timing so as to be blocked). Good case. What if the non-conducted p waves come later then they should be? Normal PP interval is 8ms but for the non-conducted P its 10ms, and right after it is only 6ms. What would you think of it? Thank you!